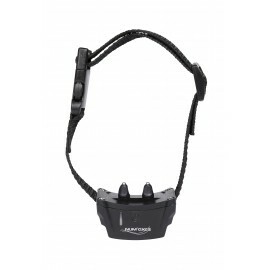 dimensions: 2,36" x 1,26" x 1,26"
The bark collar SMALL BARK CONTROL is one of the smallest bark control with static stimulation currently available on the market. SMALL BARK CONTROL works by static stimulations. It is designed for small dogs (up to 4 kg / 8.8 lb:oz). This collar has been designed to reduce the number of nuisance barks. dimensions: 2,15" x 1,57" x 1,41"
At the first bark, a series of 6 beep sounds is emitted. If another bark is detected within 30 seconds, another beep sound of 2 seconds is emitted together with a stimulation (short or long as selected). Inhibition of any further stimulations is dependant on the absence of any barking within the next 30 seconds. Beep-only mode: in this case, only the warning beep sounds will be emitted.